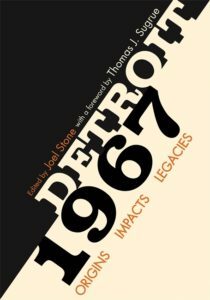 Detroit 1967: Origins, Impacts, Legacies, edited by Detroit Historical Society senior curator Joel Stone, draws memories, facts and analysis together to create a broader context for conversations around the events of July 1967. Twenty contributors, from journalists like Tim Kiska, Bill McGraw, and Desiree Cooper to historians like DeWitt S. Dykes, Danielle L. McGuire and Kevin Boyle, have created a rich body of work on Detroit and race, compiled here in a well-rounded, accessible volume. In order to tell a complete story, Detroit 1967 moves from examining colonial slavery along the Detroit River up to the state of race relations today and suggestions for the future. Readers are led down a timeline that features chapters on the critical role that unfree people played in establishing Detroit, the path that postwar manufacturers within the city were taking to the suburbs and eventually to other states, as well as the widely held untruth that all white people wanted to abandon Detroit after 1967. Learn more and order from Wayne State University Press or purchase wherever books are sold.